The Rugby Football Union has appointed Bill Sweeney as its new chief executive. Sweeney joins from the British Olympic Association where he held the same role and replaces Steve Brown, who resigned in November 2018 after 14 months in the job. Director of professional rugby Nigel Melville had been in the role on an interim basis. "This is the only opportunity I would have left the BOA for," Sweeney said. "From the grassroots game to our England teams, rugby's values and opportunities are very special. I am passionate about the game and it is an honour to be joining the RFU team." Before joining the BOA in 2013, Sweeney had senior roles in sports businesses including Adidas and Puma, as well as having corporate management experience with Shell, Mars and Unilever. Sweeney walks into an RFU that is in consolidation mode after a difficult 2018, with former chief Brown quitting the role following a tough financial period at Twickenham. As well as being responsible for steadying the ship financially and placating dissident RFU grandees, Sweeney will have plenty to resolve when it comes to the England senior team. England boss Eddie Jones reports directly to the RFU's CEO, and while Melville has been leading the search for Jones' successor, Sweeney will be heavily involved. 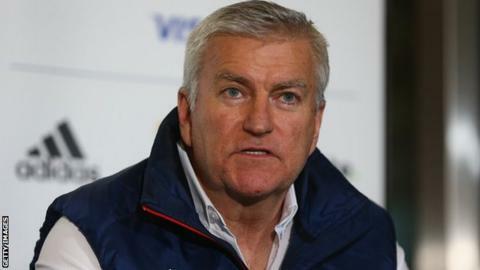 Like Ian Ritchie and Brown before him, Sweeney will therefore be in charge of hiring and firing the England head coach - in the absence of a director of rugby figure.